Ecobee4 calls itself “more than a smart thermostat.” Using the built-in Alexa system, you can do a lot with this little device. Not only does it manage the heating and cooling of your house, but you can even order groceries with it. Ecobee4 uses smart sensors placed around the house to monitor hot and cold spots and regulate comfort throughout your home. Other cool features include: Away/Home mode, smart recovery, alerts and reminder, follow me and home IQ. This device will instantly become your favorite because of the built-in support for the Alexa ecosystem allowing you to perform the hundreds of skills and thousands of commands. The embedded, high-quality microphone makes clear voice recognition a snap. 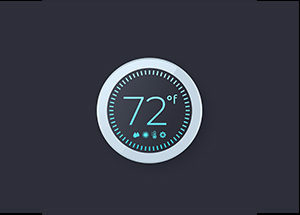 Even better, this smart thermostat is ENERGY STAR certified and saves on average 23% in heating costs per year. You can control Ecobee4 easily with any IOS or Android device, and it also works with Apple Watch.